I have lots of little plans for the day. Church, checking out a flea market, and puttering in the yard. Oh, and spiffing up the house in prep for having the Bible study here Tuesday morning. Things like digging out the coffee urn, plates, napkins, forks, finding some new tea, and some refreshments. I already have the Easter decorations out on the dinning and the kitchen table. As for my food, I’m combining Whole30, Keto, & Clean Eating. 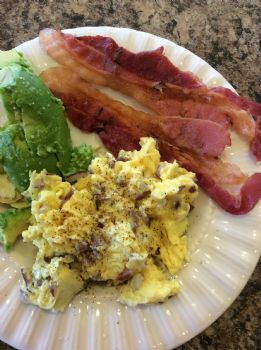 Because of the area of the country I live in, it is very difficult to find certain items (such as no sugar bacon/sausage or grass-fed protein in small enough portions for one). I feel that this “diet” must be sustainable for me for the long term. So, I buy the best, hormone-free, no additives products that I can find and let it go at that. I am eliminating sugar, grains, and most dairy. I do not quibble over a sprinkle of feta in a Greek salad but try to leave most of it in the bowl. And I might have a bit more fruit that Whole30 calls for, but I’m cutting down on that too. I’m trying to not obsess about it. It is great that you are not stressing about your diet. Stress leads to not eating good things or eating more in some cases. Sounds like you are striving for progress not for perfection. I love how you are fitting the diet to your lifestyle. You're right -- it has to work for you. That looks great. Your approach is so sensible. I have always tweaked diets to make them where I could do them so I understand. I live in a rural area and we don't have access to things like Whole Foods and Trader Joe's. We don't even have a real health food store. I don't nix any veggies or fruits I like unless they are really high sugar like dates. I try to avoid processed foods.